Cordwainer is one of the smaller City Wards but is literally at the heart of the City and therefore is constantly in demand for headquarters office buildings for world class occupiers (see Ward Businesses). Like the rest of City, the property market here is dynamic and constantly meeting the demand for the best accommodation to the highest international standards. Current schemes and proposals below reflect that – potentially bringing up to 10,000 people in to the Ward in the next couple of years. On one of the best, if not the best, site in the City of London, the new Bloomberg development was officially opened in October 2017. The stunning buildings on 3.2 acres – providing over 1.2 million square feet of office and restaurant space – used 15,500 tons of steel and aluminium and 600 miles of fibre optic cabling. The extraordinarily high quality of materials used in the construction – Italian bronze, Yorkshire sandstone, the highest BREEAM rating for energy conservation, for example, reflect the close personal attention to detail of Michael Bloomberg and Norman Foster of architects, Foster+Partners. 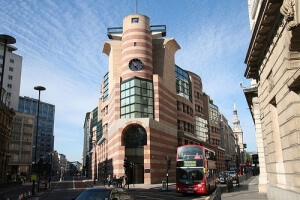 There are two principal buildings – between Queen Victoria Street and Cannon Street – dissected by the new Arcade continuing Watling Street straight to Cannon Street Station. The Arcade will house up to 15 carefully selected food operators . The whole occupational ethos will be quite unique, providing vast column free-open areas, fresh air options from opening windows and roof above the ground floor-to-roof spiral walkway and innovative all–glass lifts. Near the main office entrance in Bucklersbury a new theatre auditorium is being fitted out together with a surprise feature known as the Vortex. The new entrance box to Bank Underground and the Drain has been handed over to the TFL contractors where two new banks of escalators from the new Walbrook entrance will transform the access planned to open in early 2018. Right next door will be the re-instated ruins of the Roman Temple of Mithras – back to its original locus and housed on three levels in a new public area; this will include an Exhibition space housing some of the 10,000 Roman artifacts found during excavation on the line of the Walbrook River. 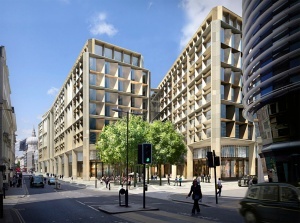 The City of London Corporation is working closely with Bloomberg on the Streetscape as three new Squares are created at Queen Street/Queen Victoria Street, Queen Victoria Street/Bucklersbury and Walbrook/Cannon Street. Again, the highest quality materials are being specified and will include fountains, pools, planting and seating areas. 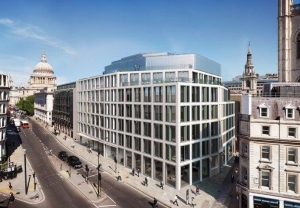 45 Cannon Street is a significant new office development being undertaken by Morgan Capital Partners and London Watling Court BV. 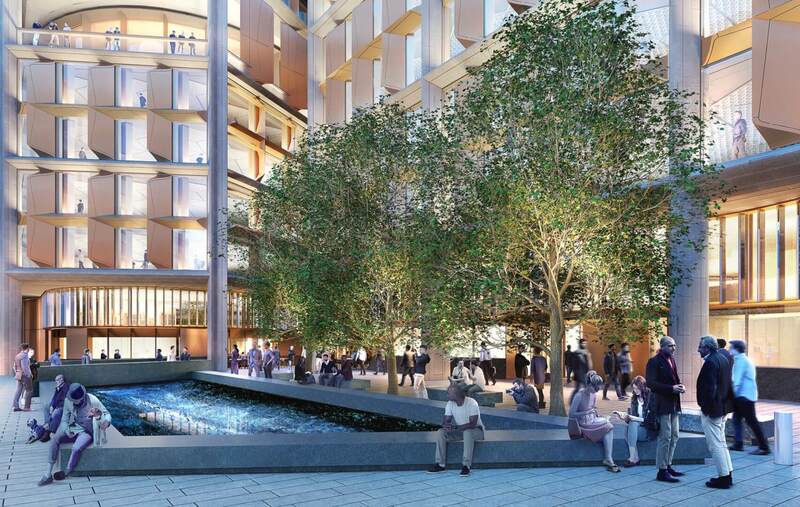 Situated centrally in the Ward at the junction of Cannon Street and Bow Lane, the Fletcher Priest designed scheme will provide 84,600 sq ft of modern offices, 6,000 sq ft of new retail units, and a new entrance to the subway to Mansion House tube station. Typical office floors will provide up to 14,517 sq ft of virtually column free space with excellent natural light on all sides. Levels five, six and seven provide expansive terraces and uninterrupted views from the roof terrace to St Paul’s Cathedral . Go to www.45cannonstreet.london to learn more. Formerly occupied by Aberdeen Asset Management who moved to their new City HQ in Bow Bells House nearby, this key building now has planning permission for a substantial refurbishment by Friends Life Limited (With Profits Fund) with architects Rolfe Judd. Work has not yet started but the alterations include a new office entrance, improved colonnade to Bow Churchyard and several set-back roof terraces. The relocation of the office entrance from the central atrium to the western retail unit on Queen Victoria Street with associated alterations to the shopfront. Alterations to the two windows to the ground floor pub. The creation of a flexible shop (A1)/office (B1) unit that occupying part of the former office entrance and part of the western retail unit onto Queen Victoria Street. A new door to be installed facing into the atrium. Modifications to the retail unit windows facing into the atrium. Alterations to the first and second floor of the atrium to enlarge existing windows and create additional windows.